In a marketplace that is becoming increasingly competitive, accepting credit and debit cards is no longer a luxury for business owners. It’s a necessity. However, accepting credit cards also means that you have to deal with fees, regulations, and requirements, which can be frustrating and expensive. To avoid any potential hiccups, here is everything that you need to know about accepting credit cards for your business. The first step that business owners should take is knowing the terms commonly used in the credit card industry. 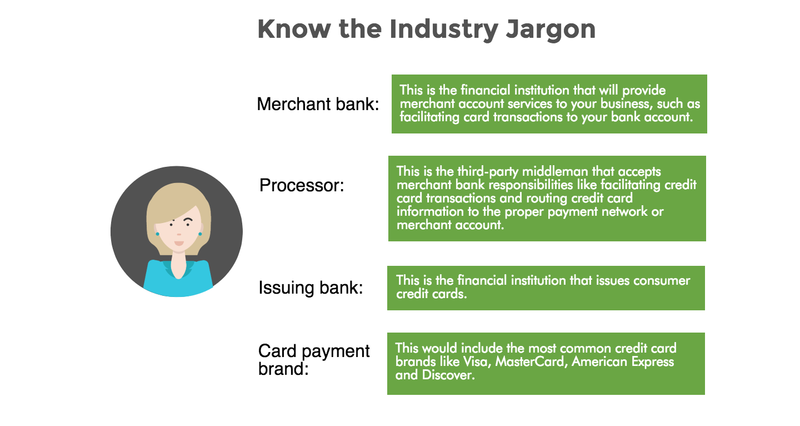 Being aware of the lingo will assist you selecting a credit card processing system, as well as making more informed decisions and preventing any future headaches. Merchant bank: This is the financial institution that will provide merchant account services to your business, such as facilitating card transactions to your bank account. Processor: This is the third-party middleman that accepts merchant bank responsibilities like facilitating credit card transactions and routing credit card information to the proper payment network or merchant account. Issuing bank: This is the financial institution that issues consumer credit cards. Card payment brand: This would include the most common credit card brands like Visa, MasterCard, American Express and Discover. Here some other terms, courtesy of Quickbooks, that you should learn when you start to accept credit cards. Authorization fee: If there are transactions where the cardholder and card are not present, you may have to verify the cardholder’s address in order to qualify for the discount rate. All processors charge a flat fee per transaction for this verification. Batching: This refers to settling the charges to your terminal by sending the completed transactions for the day to the acquiring bank for payment. To receive the best possible rate on all of your daily transactions, it’s required that “batch out” within 24 hours. Card association: Every credit card brand is a part of a card association, which is the network of issuing and acquiring banks that process it. Chargebacks: Within 60 days of the statement date, the cardholder has the right to dispute a charge. The complaint go to their issuing bank and is followed by a retrieval request, which costs between $10 to $50. Failing to respond promptly could result in an additional fee or loss of the transaction completely. Once you receive a refund After a refund, you’ll may lose the interchange fee from the original transaction along with the sale. Downgrades: If one or more of your qualifying requirements have not been met then your risk exposure will increase, which in turn means you’ll face a downgrade. Interchange fees: Major card associations will charge an interchange fee for processing each transaction. Fees vary depending on how the transaction is sent and what type of merchant account you have. Mid-qualified rate: You’ll pay a mid-qualified rate when you accept and process a card that doesn’t qualify for the lowest rate manually entering card information, instead of swiping it. 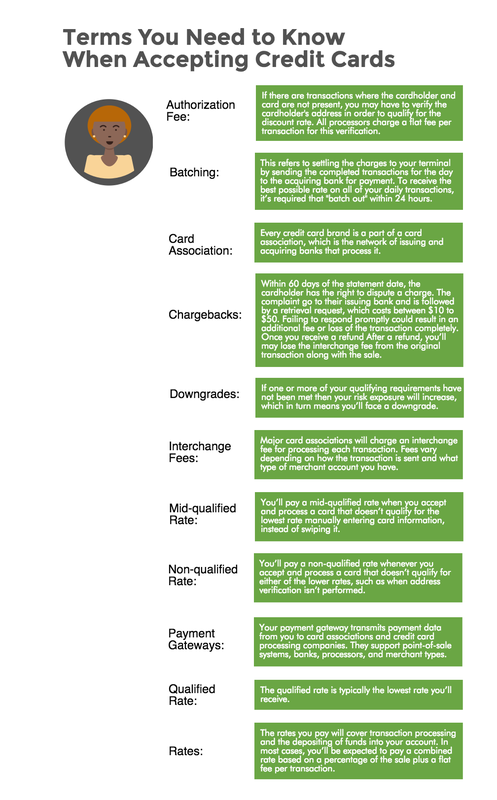 Non-qualified rate: You’ll pay a non-qualified rate whenever you accept and process a card that doesn’t qualify for either of the lower rates, such as when address verification isn’t performed. Payment gateways: Your payment gateway transmits payment data from you to card associations and credit card processing companies. They support point-of-sale systems, banks, processors, and merchant types. Qualified rate: The qualified rate is typically the lowest rate you’ll receive. Rates: The rates you pay will cover transaction processing and the depositing of funds into your account. In most cases, you’ll be expected to pay a combined rate based on a percentage of the sale plus a flat fee per transaction. Finding the right processor for your business depends on the type of business you’re running, how and where you intend to conduct most of your business, and how much streamlining you’ll need to make running your business run smoother. For brick and mortar store you’ll need a POS system, card reader, and merchant account. Online retailers will require a payment gateway and merchant account. We’d be happy to help you out at Due! If you process a lot of transaction you may also need a shopping cart. If you run a mobile business then you’ll have to use a card reader and merchant account, such as Square. A percentage of the transaction. A fixed amount per transaction. Setup and service fees that aren’t based on the amount of transactions you process. Fees are also based on the amount of transactions you process, as well as the size of those transactions. If transaction sizes are less than $25, the fixed amount per transaction the fixed amount per transaction is the area that you to minimize. For larger transaction sizes the percentage you are charged per transaction will be more important. Upfront setup and ongoing fees that the merchant service provider charges are more important for smaller transactions. A majority of merchant account service providers will negotiate fees if you simply speak with them. The pricing model. Some process use a fixed percentage based on the type of credit card, and includes bank fees, credit card company fees, and merchant account fees. This is called a tiered pricing system. The other is the “interchange +” model, where the merchant account fee is set, however, all of the other costs, like bank and credit card charges, are passed along to the merchant. The fees for debit cards and credit cards. Debit Cards can range from 0.2% – 2.0% of the transaction, plus a fee from $0.11 to $0.25 per transaction. Credit Cards can cost between 1.5% – 4.0% of the transaction, plus a fee from $0.20 to $0.30 cent per transaction. Upfront or setup fees like training, hardware, and integrating the software into your existing equipment. Monthly or annual fees for Payment Card Industry (PCI) compliance fees for security. Fees for purchasing hardware or leasing equipment like a POS system. Online processors may charge fees for integrating a payment gateway or shopping cart. One of the challenges that small business owners must face is meeting vendor requirements. In other words, if your business doesn’t generate enough revenue, some credit card processing companies may turn down your application. While revenue requirements vary, it’s not uncommon for some credit card processors to require at least $10,000 a month in revenue. Thankfully, there are a number low-revenue-friendly vendors like Due and BluePay that provide customized solutions for your specific business. Like revenue requirements, how soon you have access to funds varies and are based on factors like the type of payment (ACH or credit card), the processor, and the solution provider (a software provider, a financial institution). Many processors today grant next-day access to your funds. However, that’s not the case for all processors. PayPal Here, for example, can take up-to-a-week, while American Express cards are processed between 3 to 5 days. Businesses of all-sizes are expected to meet security standards. This means that you are responsible for making sure that your vendor has the proper security standards and compliance in place, such as the Payment Card Industry (PCI) Data Security Standard, the three-digit Card Verification Value (CVV2), Secure Sockets Layer (SSL) protocol and End-to-End Encryption (E2EE). If you want to improve the customer experience, then it’s probably in your best interest to offer refunds. Some processors will charge you a small fee for refunds, however, they’ll refund the interchange fee. Other processors will keep the interchange fee intact, as well as charge you a transaction fee and a processing fee. Also keep in mind that there is a time limit on refunds, typically 60 to 120 days after the transaction. If a customer disputes a charge because of an unauthorized transaction, you may be charged a processing and chargeback fee and even lose the interchange fee you paid on the original transaction as well as the sale, if you do not respond in a timely manner or did not your due diligence, like confirming the identity of the cardholder. Next PostBusiness Payments: Could We Be Moving Away From Banks?